My Match Game fav, Debralee Scott followed by Fannie Flagg. I always loved CNR though, and Brett. Did you think it was a ghost? As for Matchgame, CNR was the best. I always hated Dawson because he thought he was too cool. Flagg et al. are great, but you simply can't touch CN mother f-ing R! I'd like to hang that black velvet CNR painting above my mantle. AAAARRGHH! Zibbs scared the crap out of me. How embarrassing. Great list Booksteve! Appreciate it. As I said on your blog, I hate tagging people because you don't know if their irritated or pleased with the tag. I did the tag. The post is up. Hey Gil. These were cool ones. Thanks for the tag. I'll try to get it done as soon as I can. Have a great weekend. Cheers! Hi Gilligan. I popped over from Joe's at 70s-Child. So...if you can divulge, what do you testify about? Is it in open court or in chambers? 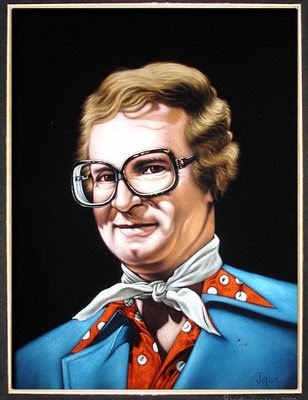 I sure miss Charles Nelson Reilly. I'm with you on Match Game, boy I used to LOVE that show. Marissa - Open court - DNA evidence. K&S - CNR could pull off an ascot - that says something. If I wore an ascot I would be laughed at. Thanks to Joe and Keith. Retrohound - Thank goodness for the game show network - CNR is still alive in the Gilligan household. Heck it probably helped that you were drunk while taking the GRE....When I took it I really couldn't make much sense of it sober.